Spazio has evolved: the alumni of my professional cooking school who build their bones on the stoves, have grown, in a certain way I also grew finding myself on the same navigation route (from Rivisondoli to the world, always remembering that everything started in Abruzzo and there has to circle back) together with the idea of ​​a new Italian cuisine that is accessible to a larger scale, where through technique the focus concentrates on true taste and well being. The new born in the Spazio family is in Rome: a multi-functional venue, with some important changes compared to the original formula. I thought of a small leaflet to share with you the story of Spazio, which you can find here in both the classic version of Laboratorio reale and as a booklet, to browse, download and file. When I decided in 2013 to open the first Spazio, which we jokingly dubbed “Spazio 0”, in Rivisondoli, I started from a premise more practical then philosophical: we had empty spaces in Viale Regina Elena, occupied by Reale until the second Michelin star, and we needed to give them a purpose, a meaning. Together with Gaia Giordano, who has been responsible for this project from the outset, we thought about the young graduates of the first Niko Romito Formazione, the school that had been founded along with Casadonna just two years earlier, in 2011 (since renamed Accademia Niko Romito). Training human resources is my passion, but that’s not enough: young cooks, once they’ve graduated, need to work, but I can’t absorb them all at Reale. So on August 5th, 2013, we opened a space in Rivisondoli (“This isn’t a restaurant, it’s a laboratory!”, I’ve said since the beginning) their unseasoned energy could find an outlet and a ‘spazio’ to complete their training and prepare for their entrance into the world of work. Many were hired by Spazio, and it was there that they received their first salaries as professionals. Spazio’s approach to food is what we teach at the Accademia and derives from the principles of Reale, naturally calibrated to a more informal type of experience: maniacal study of the raw ingredients, awareness of Italian and Abruzzese tradition, precise technical-scientific knowledge. Going deep until it becomes natural to lighten and simplify: I often repeat that uniting Reale, the Accademia and Spazio there is a system of communicating vessels, and this applies to all my projects. Ideas always flow in both directions, from top to bottom and vice versa, and this keeps us motivated and productive. Not long after opening what still remains a seasonal restaurant in Rivisondoli, active only when tourist traffic makes it sustainable, we opened a Spazio in Rome, on the premises of Eataly Ostiense. Then we opened another location in Milan, on the third floor of the Autogrill Mercato del Duomo. While the format of Spazio grew and evolved, there also emerged a need to communicate it effectively to the public, which meant we had to deal with the limitations of words. We make comforting, high-quality food. Yet I hesitate when I have to use one word to describe it. What is Spazio? A bistro? A neo-trattoria? I don’t like the idea of using a French term to describe an Italian dining format, but “trattoria” doesn’t capture it, and “neo-trattoria” seems more suited to a restaurant that does the work of updating the codes of our cuisine, with the canons of contemporary service (like Spazio), but without straying too far from the regional, hyper-local component. I haven’t yet found a term that satisfies me, and for now I’m happy to say that Spazio is a “casual dining” format, or, when I want to be witty, that Spazio is to Reale like prêt-à-porter is to haute couture. Perhaps it’s not necessary to stick a label on it. What is certain is that the new casual or middle-end concept is interesting and successful for three reasons: it is free of fixed codes and therefore can accommodate a variety of models; it is always in the hands of chefs of considerable talent and training (this is what is new and recent; the middle end isn’t new); the general public likes it a lot. This last point is its true strong point: for the cook, the middle-end model is the most effective way to bring his ideas and values to huge numbers of people. Many people have come to Reale after having first tried Spazio: it functions as a first point of access to my system. When we opened “Spazio 0” we committed to send the young cooks to the front lines, creating an experience that would place all responsibility on them. One of the rules was that the cooks themselves had to describe the dishes, leaving the kitchen an interacting with customers under the supervision of a dining room manager. We’re still doing that at Rivisondoli, since the space is small and the clientele is like family (almost all the customers are friends, and they return year after year), making this formula sustainable. In Rome, after an initial attempt, we decided not to replicate this practice, and in Milan we’ve never tried it at all. After Rome and Milan, the formula of Spazio slowly but inevitably evolved. With the multiplication of openings (and in view of those still to come), it was natural to centralize menu development in the laboratories of Casadonna (a bit like we did for the project with Bulgari Hotels & Resorts), in such a way as to create a common language and to standardize the protocols. 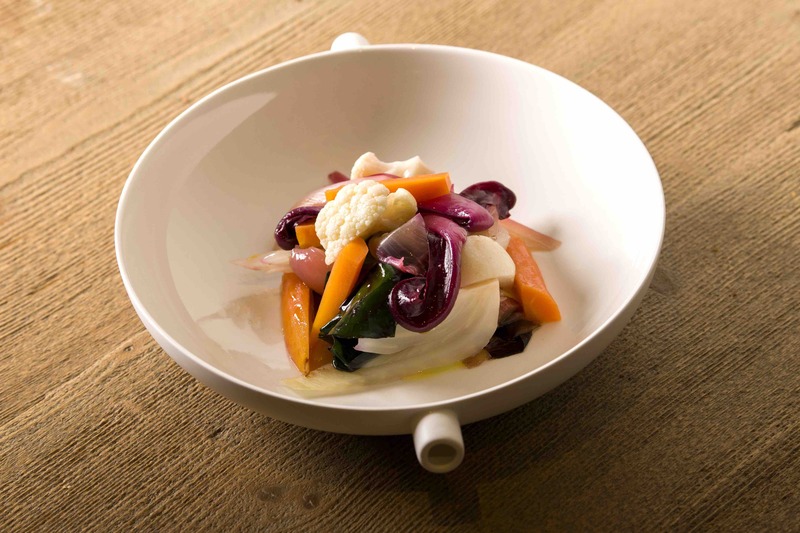 The dishes are born here, working with Gaia, and then they go to the Spazio kitchens, where they are further calibrated and transmitted to the young cooks, who then execute them for our customers. today there are still graduates of the Accademia Niko Romito in the kitchens of Spazio, along with other professional cooks, but over time the profile has repositioned to a higher level: it continues to belong to the dining model that can be considered “middle-end” in terms of price range and wine list, but it is extremely meticulous, even sophisticated, both in the substance and philosophy of the menu and the level of service. Spazio is fresh but technical, accessible but structured. Joy and pleasure are always our aim, but there’s a greater awareness in everything. Spazio was born with the Accademia and its objective is still the valorization of its resources, but we’re hardly beginners. This growth is reflected in the names: while Spazio Rivisondoli is “a project of the Accademia Niko Romito”, the other locations will become simply “Spazio di Niko Romito”. There’s also a new logo: after eliminating the parentheses, which made us feel a bit cramped into a “finished space”, we opted for a very simple font, because that’s what we are by nature; a font which, despite its solidity, “breathes” through a play of lateral cuts that suggest a glimpse into another dimension. Our encounter with Italia Cibum SpA, a dynamic company that realizes projects aimed at exporting and promoting the excellence of Italian food and wine around the world, has made it possible to further valorize the Spazio format in view of its development on international markets. Through a financial transaction in which Banca Profilo acted as advisor, a business model was developed with unique features, involving the creation of 8 restaurants in 5 years, in exchange for an investment of approximately 20 million euros: an ambitious program that promotes the growth of an innovative business model dedicated to quality cuisine, worldwide. It will be the real proving ground for the Spazio format – a format can only be defined as such if it has proliferated – and an opportunity to test it with a non-Italian audience: no mean feat, which will challenge the communicative and seductive power of our dishes. The aim will be to allow people to directly experience the beautiful, the good and the modern side of our cuisine, without explaining too much. As I said when I launched my collaboration with Bulgari – which is, of course, in the very different luxury segment – exporting our way of understanding the flavors and rituals of food, creating a strong and recognizable language is my passion, both in terms of fine and casual dining. And the latter is the challenge of Spazio. But we will have plenty of time to deal with that in the coming years. For now, we begin with the first new opening, which is still in Italy, in Rome. 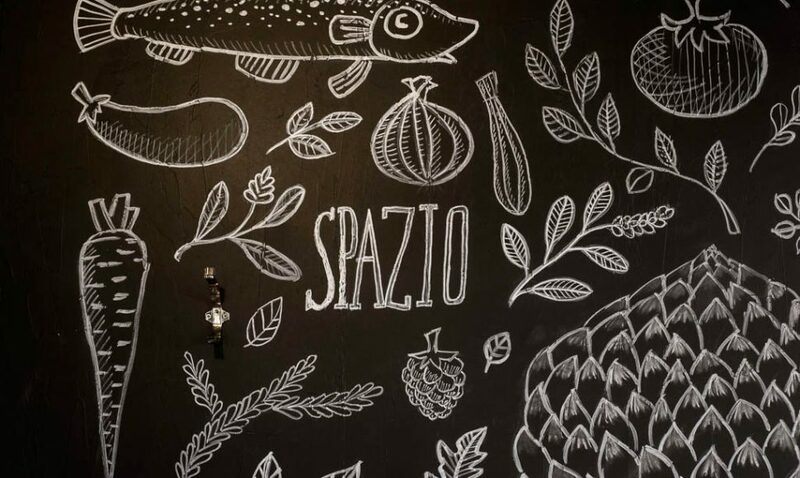 Spazio Roma has opened in the Pinciano/Parioli quarter, on the corner of Piazza Verdi and Via Guido d’Arezzo, just a stone’s throw from the historic palazzo of the Italian State Mint. This is an area I know well, as I lived there during my high school and university years. We’ve restructured a two-story space of 450 square meters for a total of around 70 seats. From the street, a large iron gate conducts to the main dining room, which we built ex novo: an ample and luminous veranda with a steel and glass roof that looks out onto a garden of palms and oleander, framed by series of residential buildings in the Renaissance Revival style. The floor is made of recycled cementine, identical to those of Casadonna’s new rooms: for me, continuity among my projects is important, and this applies both to the gastronomic concepts and the materials. The interior design, by Studio Triplan, aligns with the traditional motifs of Spazio, such as antique wooden planks, concrete, iron, and a mix of vintage and modern furnishings, from Thonet to industrial tables, with some collector’s items like Saarinen’s Tulip tables and Gio Ponti’s Leggera chairs. Also interesting is the modulation of the lighting, a combination of lamps and spotlights (by Davide Groppi, Erco, Henge and others) that change from room to room, adapting to the different souls of this place. A short staircase from the veranda leads up to the mezzanine floor, where the restaurant continues in the form of a balcony overlooking the veranda and an additional area surrounding the kitchen. We designed a large, fully open kitchen with a bar where diners can watch the brigade at work. The space is dynamic, with comfortable tables (including a social table) and shelves designed for eating on the fly. Spazio has never been as flexible as this: we want to be able to respond with agility to the constant shifts in the ways people experience food. In the basement we’ve set up large laboratories for pastry and the production of bases and semi-finished products: they operate almost all day, like the kitchens of a hotel. This is the restaurant proper, with a gastronomic offer almost totally in line with that of the other Spazio locations: the menus are nearly identical, with certain variants determined by the territory. But it doesn’t end there. A hallway connects the restaurant to an area we call “Spazio Pane e Caffè”. 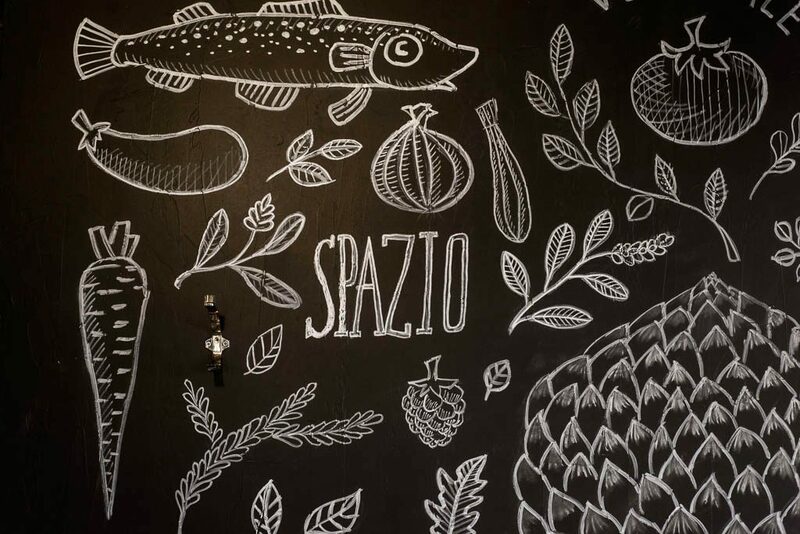 This is the real innovation of Spazio Roma, in that it introduces a new brand and a different food service model. 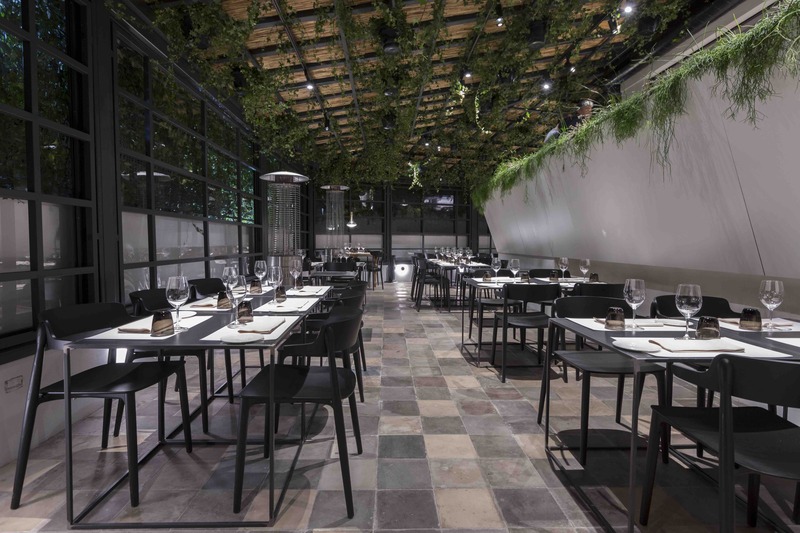 Spazio Pane e Caffè is an integrated yet autonomous operation within Spazio Roma: it can be accessed from the restaurant or from an independent entrance on the street. Here, for the first time, we debuted our new brand “PANE“. Starting this year, it will bring together our research and development on leavened products, the production of bread on a large scale, and a culinary line that draws on my philosophy but with a new approach. The headquarters of Pane is in Castel di Sangro in a 550-square-meter structure down the road from Casadonna, where we’ve set up modern laboratories and an area for retail and restaurant service. 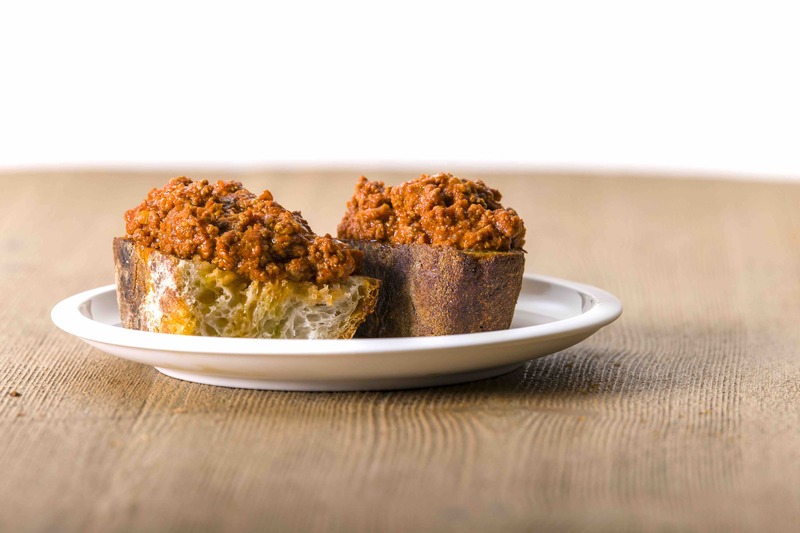 PANE will produce an average of 1,000 loaves a day, supplying all the restaurants in my group – with the exception of Reale, which will always rely on its own in-house lab – as well as a select group of Italian restaurants. 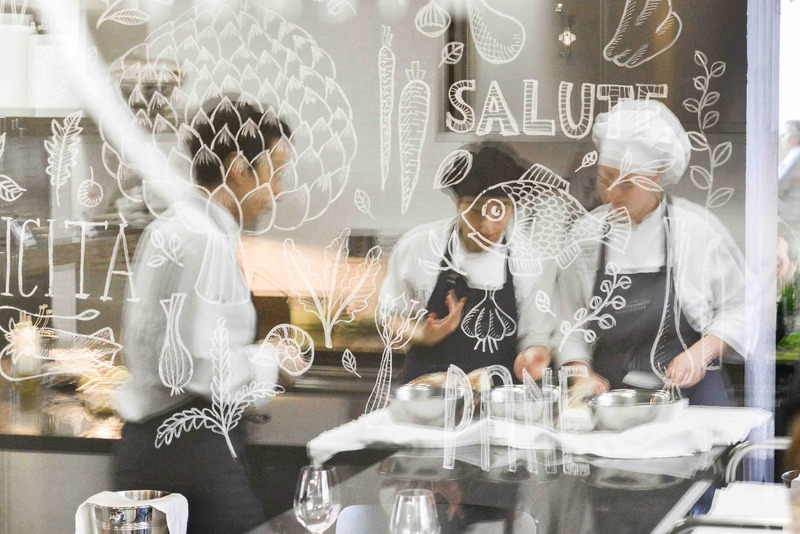 We plan to open other PANE brand stores and restaurants: in Rome we’ve decided to pair it with the Spazio format, although PANE remains a separate concept with its own identity and approach to cuisine. PANE is the natural completion of the research that we have been conducting for years on flours made from heritage varieties of wheat, highly hydrated doughs and long fermentation, a program that’s not only technical but also cultural, as demonstrated by the decision to serve bread as a course unto itself in the Reale tasting menu. We will initially cover the hotel/restaurant/catering marketplace in Italy, but I think that in the future, availing ourselves of the cold chain, we could move into mass market retail, perhaps even into exports. In Castel di Sangro we’ll also do training, teaching our philosophy of breadmaking and the proper management of the product to those who decide to purchase and serve it. 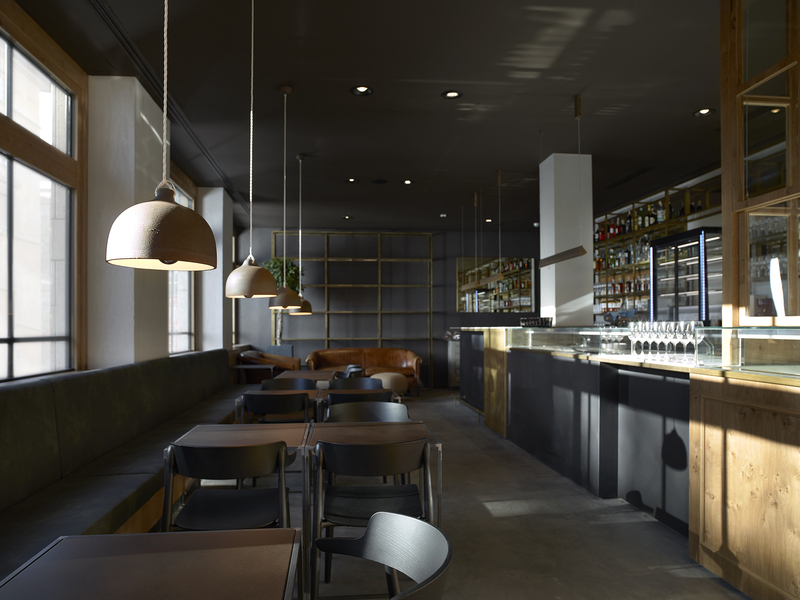 The interior design is continuous with that of the restaurant, but with details that give it a distinct personality, such as the unglazed ceramic lamps and the industrial ceiling lights in burnished brass. A cube of wood and glass, visible from the street, houses the open-plan kitchen/laboratory. There are 8 tables and a central counter made of white marble and brass where customers can sit down to eat or order take-away specialties. The area behind the counter is dominated by the bar and by orderly rows of fresh loaves, ready to be taken home. There are two menus: breakfast, which is served from 7:30 to 11am, and a single menu that covers lunch, afternoon snack time, aperitivo, and dinner, from which guests can choose one or more dishes, depending on their mood at the moment. Breakfast – as anyone who has been to Casadonna can attest, I’m crazy about breakfast, perhaps because it reminds me of my father Antonio, who was a pastry chef. I also like the way of thinking behind what it means for Italians to “far colazione” at a bar. At Spazio Pane e Caffè, guests start the day with a fine espresso (we serve the Special Blend that I developed in partnership with Illy) and an interesting selection of fruit juices prepared daily using only seasonal fruit and 7% sugar, and served in pitchers, like we do at Casadonna. Plain and filled croissants, rusk toast with honey from our apiary produced by Andrea Paternoster, classic Abruzzese ferratelle (extra crispy waffles), cookies, jam tarts, maritozzi – all made on the premises. There’s also the ciambellone, a traditional bundt cake from my mother Giovanna’s special recipe. From 11 o’clock onward, we offer a single menu which I wanted to construct around two fixed ideas: the first is our sourdough-style bread, which is kind of the star of the show, the anchor. We serve two types, the same we produce at Casadonna: Solina and Saragolla, made with two old local varieties of wheat which have been consistently grown from Le Marche to Abruzzo and Sicily, with unique nutritional properties and an incredible fragrance; and white bread with potatoes, like they still make in rural areas, because the addition of potato keeps the dough moist and flavorful longer. The second cornerstone of Spazio Pane e Caffè is the freedom to use it as one pleases: we don’t intend to create obligatory rites, we want to give everyone the possibility to build their own experience, without limits of scale or time. Like the American diner concept or, to put it our way, “tavola calda e tavola fredda”, but evolved and with artful preparations. The cuisine is simple, with a strong regional connotation (especially Central-Southern Italian), with some rustic dishes and others a big more refined, because one of the foundations of our food culture is knowing how to combine “high” and “low”. Continuing with leavened products, we have a line of grilled sandwiches, regular sandwiches (or panini) and round focacce with a range of fillings and toppings. It’s difficult to make a truly great grilled sandwich, yet it’s fundamental for the menu of a snack bar, which is why I’ve developed my own version of grilled ham and cheese and variations on the theme. As for panini, my favorite is probably capocollo (pork neck), lettuce and Dijon mustard. The focaccia is airy and light, with a fragrant crust. Examples of fillings include potatoes, smoked scamorza cheese and rosemary, or tomato, parmesan cheese, grated lemon zest and basil. Bread is the focus of the menu, but it’s not everything. There’s a small but refined section of first and second courses: soups & broths (chicory, egg and pecorino, or a minestrone built on my “absolute” extraction of onion, celery and carrot), meatballs and sauce, warm salt cod with potatoes, olives and rosemary. Then there are marinated anchovies with white wine and parsley, marinated beef with herbs, a selection of Italian-style side dishes (broccoli rabe, garlic and dried chili peppers, or, cauliflower with bagna cauda), cured meats and cheeses, and salads (warm pickled vegetables, and a salad with beetroot, potatoes, balsamic vinegar, and citrus-infused oil). And we can’t leave out our fried snacks (or rosticceria): our chips sprayed with Andrea Paternoster’s rosemary vinegar and a few croquettes are perfect for an aperitif, perhaps accompanied by a big plate of oysters. For the bar menu we worked on a small group of revisited classics with a Mediterranean soul (the aim is to do them well, without avant-garde or encyclopedic pretensions), and on a series of signature cocktails inspired by my projects, with a focus on vegetable extracts, spices, and infusions. The range of spirits is deliberately small but carefully selected, while the wine list is the fruit of our reflection on small vineyards that make beautiful wines, wines about people, wines with a reason why, accompanied by a strong core of historic labels and a few interesting champagnes. Beer lovers will find a selection of local craft brews. While the Spazio restaurant operates during the canonical hours of lunch and dinner, in function of the production times of a more structured kitchen, Spazio Pane e Caffè is the place where late risers can have soup and toasted sandwich at 4 in the afternoon, or a plate of scrambled eggs and a Bloody Mary at 6 in the evening; where parents can bring their kids for a snack, or enjoy a cup of broth with a slice of bread topped with ragù, or a plate of lasagne with a traditional side dish, or a specialty from the rosticceria with a salad and glass of good wine. To each his own. Spazio Pane e Caffè is also the first point of retail sale for our bread. Our loaves of 800-900 grams are baked every day in Abruzzo according to our traditional recipe, using only natural leaven, water, salt and flour, then flash frozen: this way, they keep their original characteristics intact until they reach Rome. 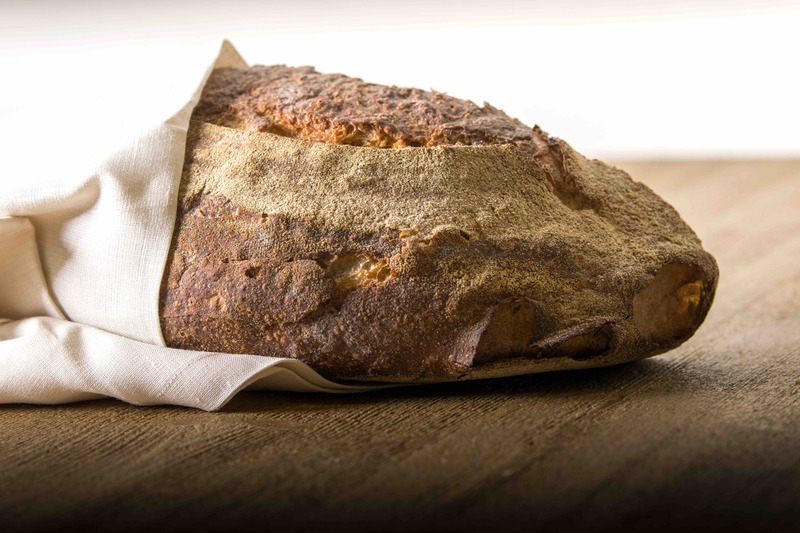 We like our bread sourdough-style, with a crunchy crust, toasted on the palate, and a moist, creamy crumb; the persistent acidity that stimulates salivation and makes the thousand aromas released during baking sparkle. A delicious and digestible bread, with its own recognizable personality. This is why we’ve been working for years on the dough, especially the flours, and leavening times and temperatures. We add a lot of water, and we extend the fermentation period, which partly takes place under refrigeration. We select the flours on the basis of production standards and their nutritional and organoleptic properties. We use a blend of Solina and Saragolla, two old varieties of wheat, a bread wheat and a durum wheat respectively, typical of Abruzzo: because their gluten is weaker, they don’t distress the body; also they’re rich in nutrients, and are exceptionally fragrant. We’ve been using them for years at Reale for our bread: it is difficult to push the fermentation and obtain an open, airy crumb with these flours, they require technique, continuous testing, and patience. Bread is a living entity and even I, who loves standardization, must admit that it’s not always possible to predict its behavior. But this is its beauty. In addition to the Solina and Saragolla bread, you’ll also find our white bread made from type 0 flour and potatoes: for this bread we use a high-quality modern wheat, which, thanks to the use of natural leaven and a very long rising period, develops an extraordinary aroma and is very easy to digest. We prefer to sell our bread in large, whole loaves of 800-900 grams to facilitate storage (the large format has proportionally more crumb and consequently traps more internal moisture). 100 loaves per day can be booked in advance: just choose the most convenient pickup time and bring home a fresh, warm loaf. Enjoy.